Entertainer, businesswoman and philanthropist Sheryl Underwood, will be the subject of an upcoming TVOne bio-documentary entitled Unsung Hollywood: Sheryl Underwood, airing on Wednesday, March 4 at 8:00pm EST/5:00pm PST. Unsung Hollywood: Sheryl Underwood takes a look at this dynamic comedienne, showcasing her most memorable standup performances, her career highlights, faith in God and some of her most moving personal struggles. Underwood burst onto the comedy scene in 1985 with her “no holds barred” brand of humor and a mic and a purse in hand. She is a multi-faceted, multi-media entrepreneur recognized as one of the most articulate, well-informed women of our time. Today, Sheryl is one of the most sought after entertainers in television, serving as co-host of the CBS television Emmy-nominated daytime show THE TALK. Underwood joined THE TALK for the start of season two, sitting alongside hosts Julie Chen, Sara Gilbert, Sharon Osbourne and Aisha Tyler. Each day, an average of 3.01 million viewers are thrilled by her snappy, upfront delivery and touching, vulnerable moments. With Underwood at the table, THE TALK received its first of six Daytime Emmy nominations, and a 5th year renewal on CBS television. Her namesake radio property, Sheryl Underwood Radio, is heard from 3-7pm daily on North Carolina A&T State University radio station WNAA 90.1 FM – Greensboro, NC; WVAS-FM – Montgomery, Alabama; 97.5 KDEE FM – Sacramento, CA; WMFA – Raeford, NC; KMGG, 99.9 THE BEAT – Albuquerque, NM, Benedict College radio station WBCT 90.9 -Columbia, SC and online at Tunein.com. This savvy businesswoman, who is Owner and Chief Executive Officer of Pack Rat Productions, Inc. and 23rd International President of Zeta Phi Beta Sorority, Inc., is also one of the world’s smartest thinkers and brightest contemporary humorists. In 2013 Underwood was honored with the UNCF Masked Award at the UNCF’s Annual Mayor’s Masked Ball in Los Angeles, California. She and NBA Hall of Famer and entrepreneur Earvin “Magic” Johnson were recognized for their support and donations that provided hope and opportunity to young people attending UNCF affiliated colleges and universities. As an actress, Underwood has appeared on multiple episodes of the Emmy winning CBS daytime drama The Young and the Restless. She has starred in such films as Bullworth (starring Warren Beatty), I Got the Hook Up and Beauty Shop (starring Queen Latifah). In addition, Underwood was the host of Black Entertainment Television’s (BET’s) Comic View and Holla, a talk show she created and produced which was loosely based on Bill Maher’s Politically Incorrect. She is a weekly contributor on the Steve Harvey Morning Show, also serving as “guest host,” and appears on The Steve Harvey Project, the television version of the show airing on BET Centric. Underwood also hosted The Sheryl Underwood Show on Jamie Foxx’s The Foxxhole, airing on Sirius 106/XM 149, where she provided a mix of political satire, comedy and music. Underwood holds an Associates of Arts degree in Liberal Arts from Fresno City College; Bachelor of Arts degree in Liberal Arts from the University of Illinois at Chicago; Masters Degree in Media Management Mass Communication from Governor State University in University Park, IL and an Attorney Assistant Certificate from UCLA. She is included among a stellar list of those named to the 100 Most Influential Organization Leaders published in Ebony magazine. On May 9, 2015, she will be the commencement speaker for the 145th Spring Commencement Activities for Benedict College, Columbia, SC, and will also receive an honorary doctorate. Through her service, philanthropy, excellence in business and tenacity, Sheryl Underwood is a source of inspiration and wisdom for women across the country and the world. 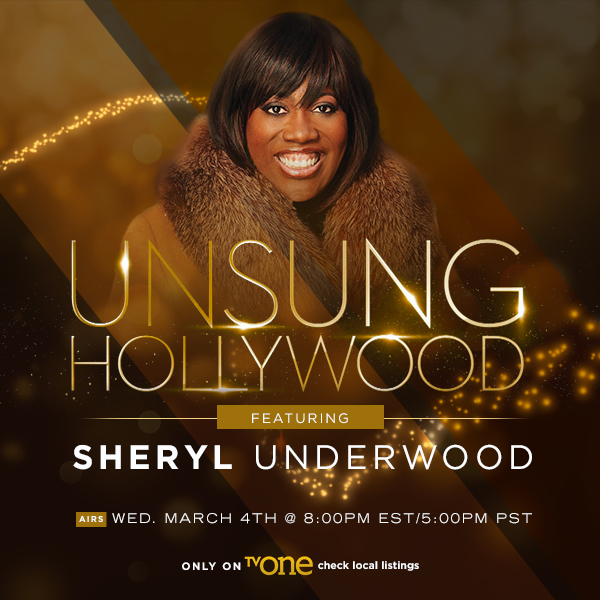 Be sure to tune-in for Unsung Hollywood: Sheryl Underwood and share on Facebook, Twitter, Instagram, Linked-In and other social media. You Don’t Want To Miss This! !